Use one zero-footprint, web-based workstation for all your cardiology needs. Expedite cardiology reporting with structured templates, prepopulated measurements and integrated access to images from multiple modalities and vendors. 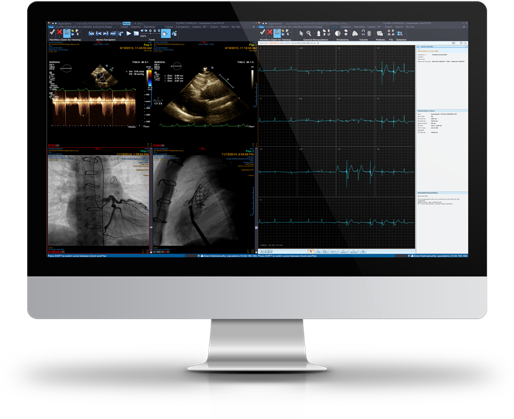 Enable onsite or remote reading of cardiology data from any networked workstation within and beyond the enterprise. Cardiac review and analysis tools provide cross-sectional views of the heart axis, four chamber views, as well as panoramic and cross-sectional views of cardiac arteries. The calcium-scoring module helps you analyze calcified plaque, while the cage-removal function removes anatomy not required for cardiac viewing. Multiframe display includes nuclear medicine, ultrasound and angiography images. Digital subtraction enhances visibility of blood vessels in bony or dense tissue environments. Embedded application to review diagnostic and interventional X-ray angiography to clearly visualize blood vessels. Comprehensive toolset for analyzing Cardiac CT studies integrated into existing diagnostic workstation. Supports Cardiac CT Analysis, Coronary Analysis and Calcium Scoring. It is extremely easy to review the Automatic segmentation of heart axes (short axis, long axis, four-chamber view) as well as single-phase and multi-phase viewing capabilities from different vendors. Cine runs as volume-cine or as phase-cine are supported. Embedded application to view ECG waveform with configurable lead display layout. Comparison of prior ECG waveform is supported as well as measurement tools like Line and Caliper. Are you looking for a single unified workstation to review radiology and cardiology exams? Have a look at the cardiology functionalities embedded in the Clinical Collaboration Platform. All in one.